Beer Belongs … Enjoy It! In the November 2009 issue of All About Beer magazine, I wrote an article entitled Beer Belongs (beginning on page 44), about the famous ad campaign by the United States Brewers Foundation that ran from 1945-1956. If you come here from the magazine, below is some additional text and also some galleries displaying all of the advertisements from that period of time that I know about. I may be missing one from either the beginning or the end of the series, before and after they were numbered, since we have no idea how many were produced during those years. The Home Life in America series, which was numbered, I believe is complete. 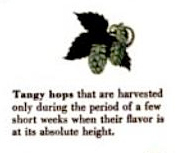 I am indebted to the Beer Institute, who provided scans of some of the ads, and helped me fill in a few gaps. 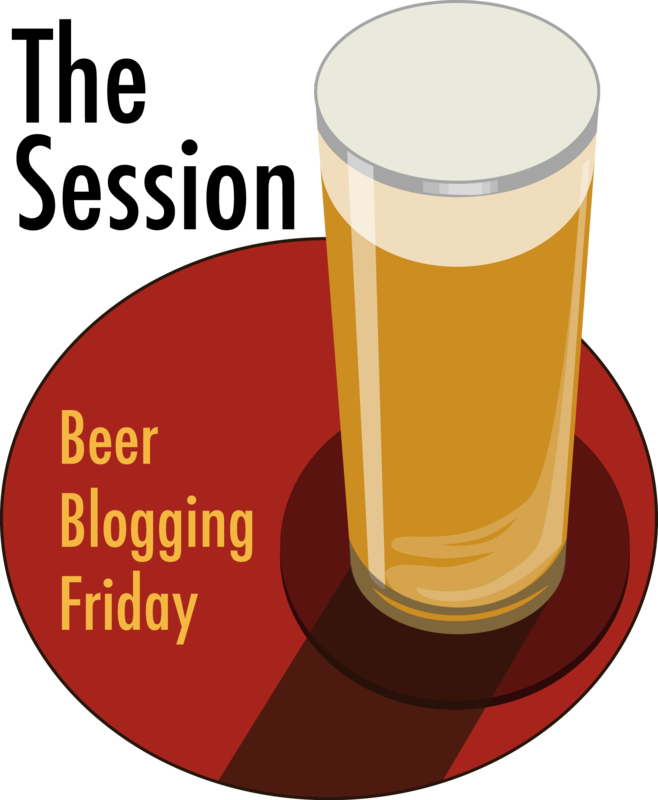 If you’ve come here through a link, I would encourage you to read the main article in All About Beer first. If you want to skip directly to the gallery of the all the Beer Belongs advertisements, click here. 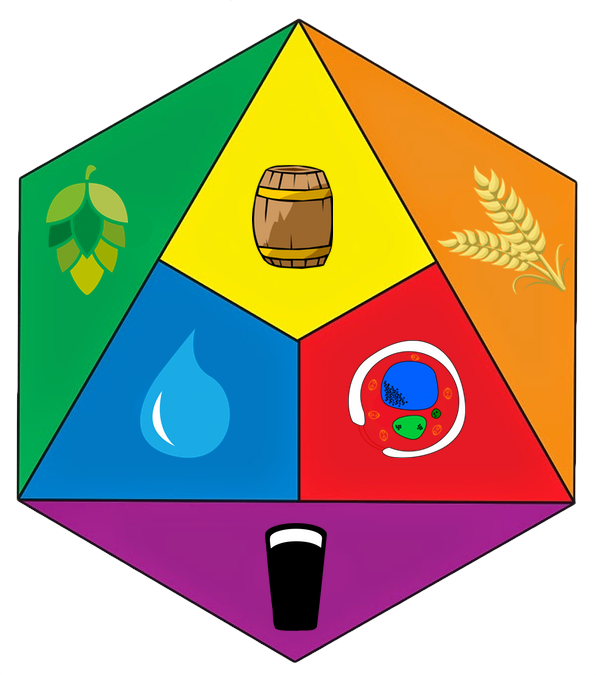 The year before World War II ended, 1944, the United States Brewers Association (USBA) and the United Breweries Industrial Foundation merged, creating the United States Brewers Foundation (USBF). During the final year of the war, the USBF created an advertising campaign to promote beer as “America’s Beverage of Moderation.” The campaign was known as “Beer Belongs” and began in 1945, though in 1946 it began numbering the ads as a part of a series entitled “Home Life in America.” It lasted over a decade, with the last numbered ad being produce in 1956. 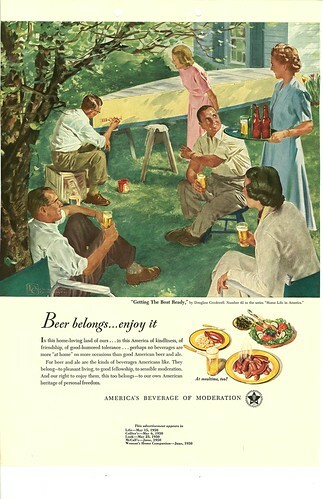 Well-known artists and illustrators of the day were commissioned to paint idyllic works showing an idealized post-war America — exclusively white I should point out — enjoying their post-war prosperity in a variety of settings, but with beer, naturally, at the center of it all. The ads are, I think, strikingly beautiful in most cases, and are some of the best examples of commercial illustration from the time period. I have four originals of these ads in my home and love them. There’s surprisingly little information about the ad campaign as a whole, and most accounts say there were 115 paintings done from 1946-56. I have discovered, however, at least 136 different advertisements. The main series began in 1946 and was called the “Home Life in America” series, and was numbered from 1-119. But there are two different #2 ads that I’ve uncovered, bringing the total to 120. The year before, 1945, at least nine additional ads were produced similar to the main series, the primary difference being they’re not numbered. Then, in 1956, there were at least seven more produced that are similar to the series but, again, are unnumbered. Five years later, in 1961, the USBF members voted to revert to the original name, the USBA, which had been in existence since 1862, making it the second-oldest trade organization in our nation’s history. Each one included a title, the author’s name and information about the series. 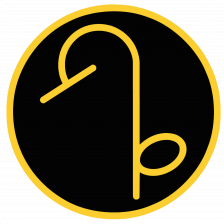 The one below is typical of the series. It’s number 42, was painted by Douglass Crockwell in 1950 and was titled Getting the Boat Ready. He was one of the most poplar artists they used, having done 70 of them, including all thirteen in 1949. Alone, he accounted for nearly half of the ads. At the bottom of each work of art they used several different templates used to promote the brewing industry and beer as a part of everyday life. Taglines used in virtually every ad were “Beer Belongs,” a shortened version of “In this friendly, freedom-loving land of ours — beer belongs … enjoy it!” So a portion of the “beer belongs” line is used in every ad. 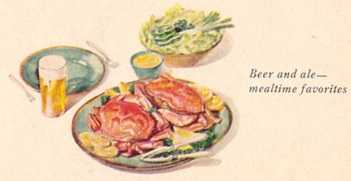 Beer is also characterized in each ad as “America’s Beverage of Moderation.” Below are some close-ups of a selection of the different elements used in the bottom section of the ads. 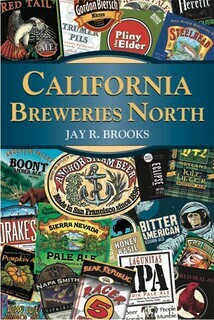 It’s not exhaustive, but gives you a flavor of how they were trying to spread the positive message of beer in society. When you’re taking it easy — what makes a glass of beer taste so good? In this home-loving land of ours … in this America of kindliness, of friendship, of good-humored tolerance … perhaps no beverages are more “at home” on more occasions than good American beer and ale. For beer and ale are the kind of beverages Americans like. They belong — to pleasant living, to good fellowship, to sensible moderation. And our right to enjoy them, this too belongs — to our own American heritage of personal freedom. Each of the Flickr galleries below is best view in full screen. To view it that way, after clicking on the arrow in the center to start the slideshow, click on the button on the bottom right with the four arrows pointing outward on it, to see the photos in glorious full screen. Once in full screen slideshow mode, click on “Show Info” to identify each ad’s title, artist and the year it ran. The main series ran for eleven years and 120 ads were produced. Even though, in a sense, this was the second phase of this type of ad, it is the most popular incarnation of the ads and the ones that most people are familiar with, which is why I’m starting with this gallery. 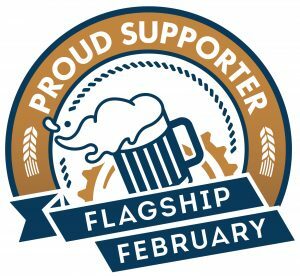 1945 was the first year that the United States Brewers Foundation “Beer Belongs” ad campaign began, and at least nine ads are known. Unlike in later years, the ads are not numbered, though they bear many similarities to the later ads. One of the two main differences are that they do not appear to be a part of the “Home Life in America” series that began the following year with the numbered ads. The other, according to an advertising website, is that the first year the ads were done by so-called fine artists and in later years were done by commercial illustrators. Each of the nine ads from 1945 is painted by a different artist (except for Julien Binford, who did two), whereas the later years saw 120 ads done by eleven illustrators. Another unique feature of the first year ads is that reproductions were apparently available free of charge, as longs as the request was made within the year. Each of the first-year ads contained the following text. The slideshow below includes the 9 ads from 1945. Some of the images are not ideal, but are the best examples that I could find for them. After No. 119 in The Home Life in America series, a few additional ads were produced with similar elements, but which were not numbered. The slideshow below includes the 7 unnumbered ads from 1956. Some of the images are not ideal, but are the best examples that I could find for them. As detailed in my article, the Beer Belongs ads grew out of working with the U.S. government during World War 2. A successful series entitled “Morale is a Lot of Little Things” was produced by brewers during the war, a few of which are included in the gallery below, along with some related ephemera. The gallery below also included two spoofs of the ads, a sure sign of their popularity.